In this Blog we will discuss some strengthening/rehabilitation exercises most commonly prescribed for those painful shins. Every individual suffering from Shin Splints may have slightly different causes and symptoms associated with them. Therefore, it is important to book into see one of our Physiotherapists who can fully assess and provide you with an individual exercise programme. Here are some simple exercises to help those ‘Shin Splints’ often seen in Runners. Step Ups: Step onto a box, leading with the injured leg, step down with the same leg, returning to start position. You may increase the height of box, and add in light weights as your strength and technique improves. To maintain equal balance between hips and knees, you may repeat on uninjured side. 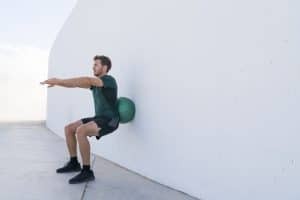 Repeat 2-3 sets of 8-12 reps.
Soleus Squat: Standing against a wall (you may place gym ball behind). Feet shoulder width apart, slide down wall to approx. 80deg. Raise heels off ground; hold approx. 20sec, repeat 3-5 times. Hip Hitches: Stand on the edge of a step. Keep the leg on the step straight, gently lower opposite leg down the side of step and then hitch this lowered hip back to neutral/start position. Repeat 2-3 sets of 8-12 reps.